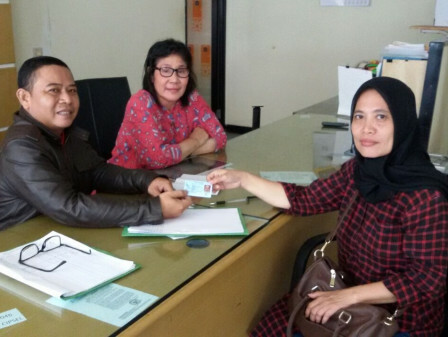 1,436 e-ID cards have been distributed to people in South Jakarta ahead of Eid ul Fitr. Its distribution was dome yesterday.
" In the weekend service yesterday, we distributed 1,436 cards"
South Jakarta Population and Registration Sub-dept. Head, Abdul Haris stated e-ID card distribution is deliberately extended thus people who will take homecoming already have ID card. "In the weekend service yesterday, we distributed 1,436 cards," he expressed, Sunday (6/10). Despite it has entered Eid holidays, hundreds of officers are still deployed to distribute the card. Considering there are still dozens of cards have yet to be distributed. "Besides that, our officer was still opening the service in urban village offices yesterday," he told. With this service, people could have ID card when they go to their hometown without anxiety. It has been poured on Act Number 23/2006 on Population Administration whereby every person must bring ID card when they take a trip. "Yesterday we also opened mobile ID card in Tegal Parang for birth certicate, e-ID card, family card, etc," he said.